Posted on October 3, 2018 by DrLax. Lacrosse is unique as a sport in that it attracts not just the desire to be great in sport, but high academic and career achievement outside of sport. This is one reason why high academic achievement and Ivy League colleges are commonly contenders for national championships…look no further than 2018 National Champions Yale University. 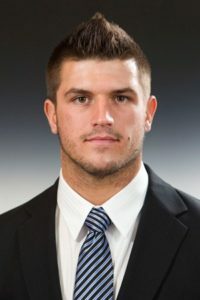 Creators Game celebrates this aspect of lacrosse and the entrepreneurial spirit the sport fosters among its participants with this series Lacrosse Culture – Profiles In Entrepreneurship. 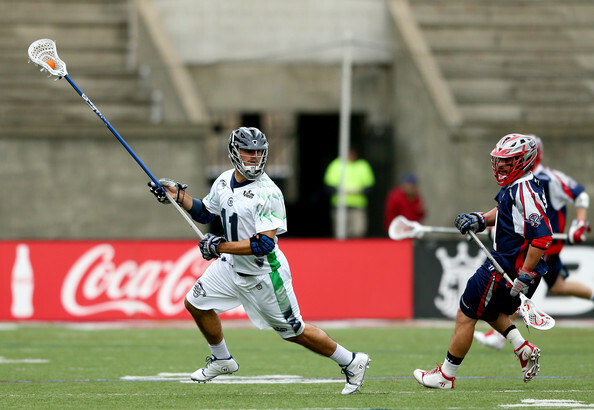 Today we showcase Syracuse legend, MLL & NLL Pro, and Team USA member Brian Megill and his company Host Events Inc. Host Events, Inc. Co-Founded by Syracuse Lacrosse grad Brian Megill and his business partner, Michelle Carazas in 2017, is a mobile platform connecting cities best bartenders with events looking for a bar presence. Whether a corporate function or home gathering, Host Events, Inc. can help elevate the occasion. On a weekly basis, people requested our services as a bartender for private events or special occasions with no formalized process or contract. We realized that many times people were desperate to find the perfect bartender to ensure the success of an event or even to ensure their establishments would realize their full economic potential on a Friday night. After conducting significant research and surveys coupled with endless amounts of brainstorming between the founders, we began to realize that no current platform existed that connects those hosting parties with professional, reliable and certified bartenders/mixologists. As simple as Uber connects drivers with riders, Host connects bartenders with event hosts. Market research analysis concludes that businesses of over 10 or more employees are offering more corporate appreciation events outside of the office to increase employee retainment. This, in turn, leads to a rise in event planning services. With businesses in the United States expected to grow in size by .8 percent over the next five years, these companies are going to be looking for larger venues and more amenities to accommodate the growth in the workforce. According to Bank of America’s 2015 Small Business Owner Report, 45 percent of small- to medium-size businesses sponsored a holiday dinner in 2015, up 2 percent from 2013. These numbers are projected to continue to increase steadily over the next five years. According to Issue-Based Information System, corporations are likely to allocate more money toward social events over the next five years. Host Events, Inc. is a double-faced platform similar to Uber and Airbnb. One side is created for those hosting the event and the other is geared towards certified bartenders. Event hosts will be able to post their events well in advance through Host, denoting dates, times and locations. Once an event is posted, certified bartenders within a certain radius will receive the notification, allowing them to “apply” to the event. Event hosts will then be able to select their choice from the applicants based on qualifications and ratings. 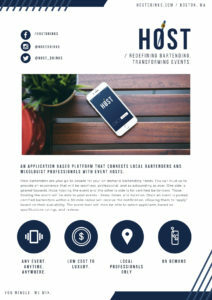 Host Events Inc, launched in the IOS AppStore in Boston in May of 2018, through support from its recent six-figure backing from LaunchByte CEO Tan Kabra and his team at Boston based seed-funding firm, LaunchByte. The partnership has taken Host from pen and paper to the app store. To learn more about Host Events, Inc., visit hello@hostdrinks.com or reach out directly to its founders at brian@hostdrinks.com.